Ask fellow campers about "Crooked Creek RV Park" and nearby attractions. We stayed one night only because it was late and there was no way to turn around to leave without disconnecting our towed car. I wish we had made the extra effort to get back on the road. The heat generated by their defective outlet caused damage to my plug. Luckily, we carried a spare, and they only cost around $25. Had to use four sewer hoses to reach the sewer connection; and, it was uphill. This requires "running" the hose (lifting it by hand to drain the contents) to make sure there were no surprises when I disconnected. Nasty work. The roads in the park had large potholes, making navigation tenuous. While the campground appeared to be clean enough, it just had an unkempt look that at least made it seem that there wasn't much effort made on the park's appearance. I cannot recommend this campground to anyone. Another camper was in the process of trying to get his money back because the park did not offer the amenities it advertised (wifi, cable, etc.) Every camper we came in contact with was grumbling about the campground. 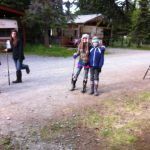 We camped at Crooked Creek RV Park in a Motorhome. Site was not level, spongy, some grass. Hookups were OK. Restroom was OKn not the cleanest, but acceptable. $7 bucks for a shower is not acceptable. I realize lots of overhead but that's too much. HOWEVER if you want to fish in Alaska this is a great place. 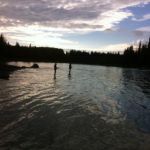 Walk to the Kasilof, or you can get charters to float fish, or go halibut fishing. Owners were very helpful and provide good service. Lots of people here if the fish are biting, so call ahead. Probably a mad house during the salmon runs. Would only stay here if I was fishing. We camped at Crooked Creek RV Park in a Motorhome. Narrow, poorly maintained, straight-in (no angle), gravel sites. Too many long-term and privately owned spaces, so short-timers pay more to make up the difference. Very far from town, any services, and highway, so only noise is from noisy neighboring sites. But had shade, full-hookups, laundry, and (poor) WiFi. Although middle-of-the-road for Alaska, we wouldn't stay here again due to high price. 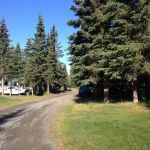 We camped at Crooked Creek RV Park in a Travel Trailer. An older campground with internal rough, potholed roads. Shaded sites are short and it is difficult to back into the sites because of the narrow roads. We camped there for three days in a 34 foot 5th wheel. The sewer connections are on the back of the camp site and difficult to reach, matter of fact we couldn't sure our because we only had 30 feet of sewer hoses. The water and electric connections were no problem. The site was sandy or muddy with grass on each side of the camp site. The people were friendly. We camped at Crooked Creek RV Park in a Fifth Wheel. Are you affiliated with Crooked Creek RV Park ?